We wish to thank all the contributors to the Countryfest Cinema. The concept for the cinema is structured as a not-for-profit organization which will contribute funding back to help other community projects. The community support for this project was tremendous including a $400,000 donation from Countryfest plus many donations from local businesses, organizations and individuals. 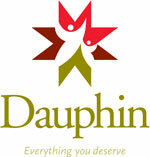 Dauphin has proven itself over and over as a community that can get things done. Thank you to all for their generosity and community spirit. Special thanks to the City of Dauphin, Countryfest, Manitoba Provincial Government, and the Government of Canada. Dauphin & District Community Foundation Inc.
Steiner Plumbing & Heating Ltd.